Wow! Not only is it a great and quick palindrome, but it is also so applicable to describe the first week of Arayot this session. With enough ideas and fun to fit into a football stadium, Arayot really got the ball rolling. 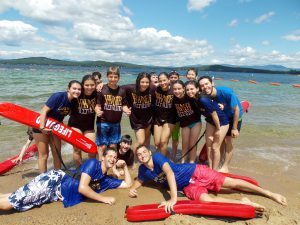 The first day was filled with action, as it with choosing chugim (electives), instructional swim tests, and kitah (class) in the morning. The afternoon consisted of sports like ping pong and basketball for the banim (boys) and parachutes for the banot (girls). After a lovely aruchat erev (dinner), Arayot came together as an aydah (unit) for erev career (career night). 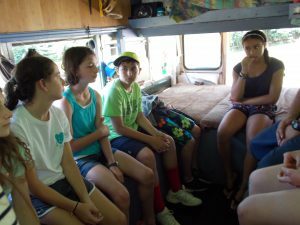 Dressing to enter their desired future careers, the chanichim (campers) went to several stations to mirror what working in the real world looks like. The chanichim participated in a chef station, secretary station, improv comedy station, and political debate station, learning the new ropes of several different career paths in a fun way! Tuesday started off with a natural feel, as the Topsy Turvy Bus came to th e machaneh to teach the kids about the environment and conservation in the morning. At night, the chanichim were split up by bunks for their peulat erev (evening activity). The banim engaged in erev deadliest warrior, where they were split into gladiators, ninjas, and shaolin monks to test their speed (through a scavenger hunt), intelligence (through playing Stratego meets rocks paper scissors) and stealth (through playing red light, green light). The banot participated in erev parent trap, where the banot found their twins, came up with secret handshakes, played newly twins (newlyweds), watched clips from Parent Trap and ate Oreos with peanut butter. Wednesday saw another “spike” in the fun-o-meter at camp! The boys became the beta testers for the newest sensation that’s sweeping the nation, Spikeball. The girls danced in the rain and made new exfoliant via yifrach (gardening). At night, Arayot joined Leviim (rising 9th graders) for erev casino, which consisted of numerous board games, card games, and chips with salsa! The spice and flavor didn’t wear off that night either, as Thursday was the camp’s first a chla yom (trip day). 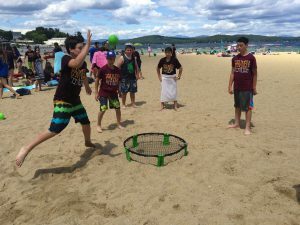 The different aydot separated for various trips, and Arayot went to Weir’s Beach at Lake Winnipesaukee for a fun afternoon of swimming, sunbathing, spikeball and sweet, sweet ice cream! After coming back to camp, Arayot engaged in a siyum (ceremony celebrating the completion of a tractate of Talmud) and got to enjoy a barbecue afterwards. Then, Arayot was entertained by the comic book sensation, Gorf. Arayot’s first Shabbat is on its way, but the real question is, will Shabbat be ready for Arayot?